Starting today, participating in GTA Online Freemode Events will earn you Double GTA$ and RP (with the exception of Time Trials). So get ready to dive into action-packed activities and challenges from the Freemode Events Update, including everything from the wanton destruction of Criminal Damage to the smuggling of Dead Drop and everything in between. With many of the Freemode Events requiring a quick and sturdy set of wheels, don't miss out on this week’s vehicle discounts. If you're looking for a ride that will take you through the Checkpoint Challenge, why not pick up the high speed Vapid FMJ, available at a 25% discount. And with 50% off the Karin Sultan RS upgrade from Benny’s, you can zip around in this swift and durable vehicle that’s great for competing in Hot Property. Also, make sure to give your new purchases the protection they deserve with 50% off Ignition and Car Bombs during this bonus period, perfect for catching an unsuspecting enemy trying to make a getaway with your prize possession. After your cars have undoubtedly taken a licking, freshen them up with 25% off all resprays. The folks at Ammu-Nation understand that you’ll need firepower if you're going to compete in trigger-happy events like King of the Castle, so they’ve lined up some healthy discounts to help give you the edge you need. Protect your neck with 50% off Body Armor and Pistols, and with SMGs and Assault Rifles at 25% off, you can hit your foes hard and not your bank account. 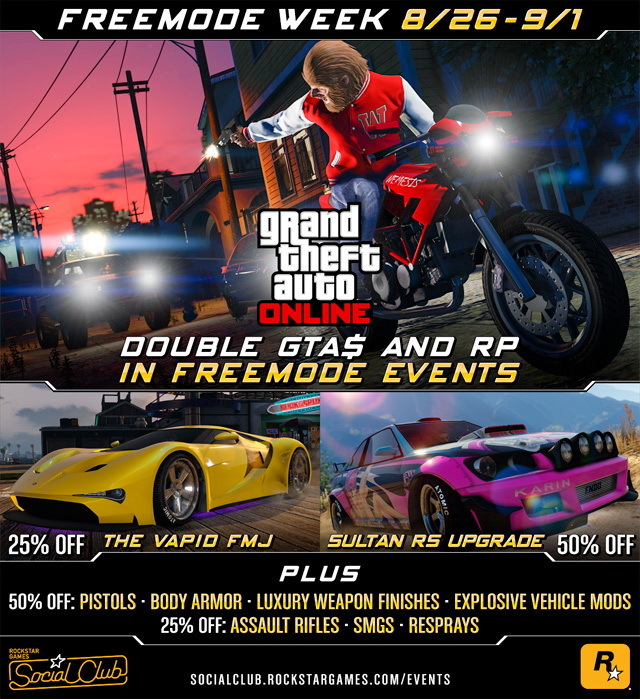 Finally, there's no rule that says you can't assail in style, so enjoy 50% off all Luxury Weapon Finishes from the Ill-Gotten Gains and Executives and Other Criminals updates. For big earnings on the track, get some runs in on Rally, this week's Premium Stunt Race which like all Premium Races, pays top finishers GTA$100,000 for first, GTA$30,000 for second and GTA$20,000 for third. Set to Sports vehicles only, all competitors in this Grand Senora-based Point to Point will be awarded Triple RP. To join in this high stakes activity, simply enter the yellow Premium Race blip at Legion Square or use the Quick Job App on your iFruit. 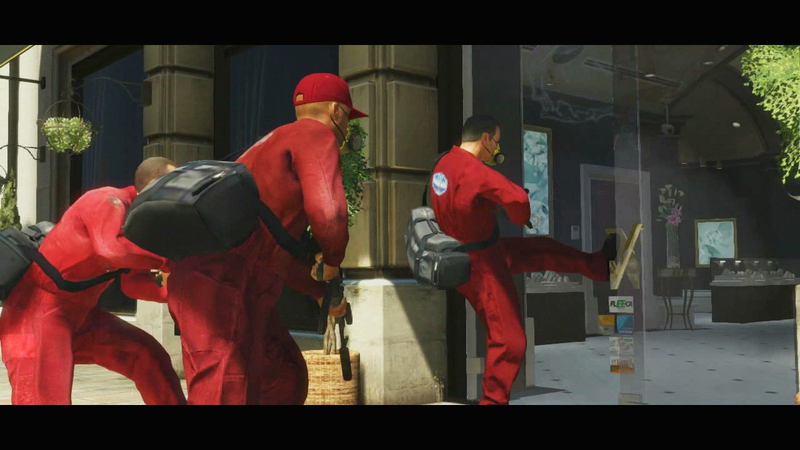 GTA Online Freemode Week - This week's bonuses in new-gen GTA Online cover freemode events. And of course there are discounts on select items too.